If you’re targeting Wahoo, you’ve clicked on the right page. We’ve got everything you need to go after them, from Wire Pin Rigs to Shock Leaders to High-Speed Bridle Weights to Cable Wind-Ons, and all points between. The speed needed to target this toothy specie can present a problem when it comes to dredge weights or planers, as it takes significantly more weight or force to keep things down at an upwards of 8 knots. Well we’ve got some innovative solutions for you, some new things to try incorporating into your spread, and a few options you may or may not have considered before. Not to mention we’ve rigged half of it into a Wind-On Bridle system, so the need for hand-lining obnoxious amounts of leader is over. So give us a try. I’d be willing to bet we have exactly what you need. Like this complete Lure Kit for targeting Wahoo. Four (4) of the best lures you can pull each rigged with 500lb stainless cable with a Mustad 7691S Stainless hook, Shock leaders and 24 and 32oz weights. 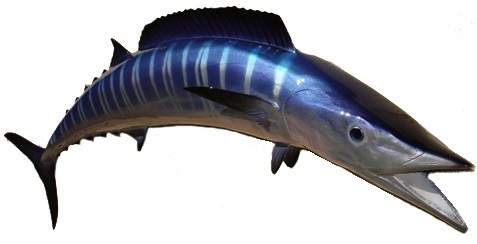 All Wahoo Lures are rigged with a stainless Southern Tuna hook with 24" of 600lb test cable. Hook and leader are heat shrunk for stiffness and the cable is doubled inside the skirt.